One of the benefits of Nvidia’s latest graphics-card range is that the laptop versions are nearly as impressive as those for desktop PCs. And not only does this full-size laptop have a GTX 1050 Ti with 4GB of video memory inside, it also packs in a top-end six-core i7-8750H main processor. Add a half-terabyte SSD and you’ve got a ridiculously powerful laptop for well under a grand – a deal that can’t be matched in competing ranges such as Dell’s G3, HP’s Omen or Acer’s Predator. Aesthetically, this is a machine that will appeal to gamers but also if you’re using it for general Windows work, photo editing or video production. It sports some mildly industrial side grilles, while its overall bulkiness – at just under 2kg in weight and 2cm thick (see images below) – is by no means the least portable 15in laptop we’ve seen. 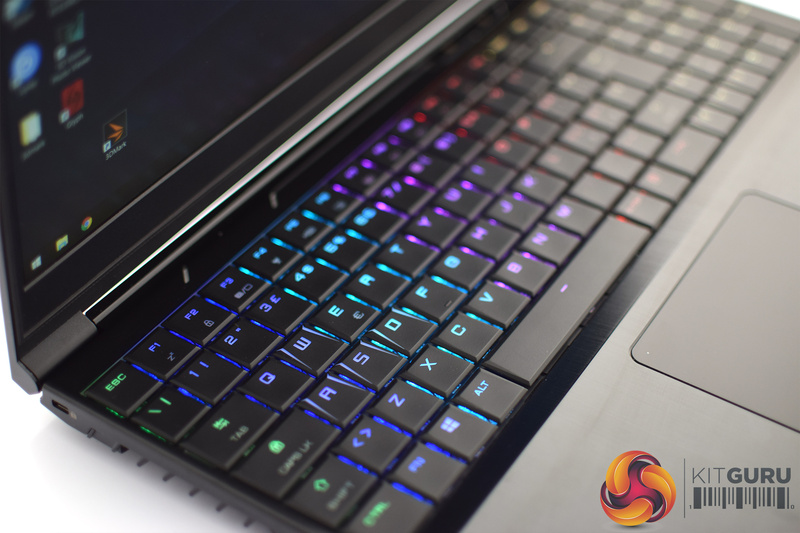 The RGB-backlit keyboard offers lighting effects that are rather fun and fully customisable, and the keys have a mechanical action that will please button-bashers and traditional typists, although those accustomed to effortless modem tile-style units may find it hard work. There’s also a huge and very responsive touchpad. The black plastic and metal finishes aren’t the most expensive-looking and prone to greasy fingerprints, while the elegantly narrow border around the screen is marred by a large blank panel at the bottom, which betrays the fact that this is a generic chassis into which PC Specialist has inserted the best LCD panel that could be found for the budget. The screen covers only 85 per cent of the sRGB range, and our test meter indicated limited colour accuracy. We’ve seen worse, and for video editing on a limited budget you might consider it acceptable as long as you have a good monitor to check colour when you’re back at your desk, but it means this isn’t a good choice for photographers. On the plus side, there’s a comprehensive set of USB ports, separate headphone and mic sockets, reasonable built-in speakers, an SD card reader, and three monitor outputs (two Mini Display Port and one HDMI). Our tests confirmed excellent all-round performance that wouldn’t disgrace a mid-range desktop PC. The battery lasted just five hours 42 minutes in our video-playback test, and you’d see less in heavy use, but that’s as we’d expect. It would be a stretch to call this the perfect laptop, but at this price it's fantastic value for the level of performance it offers.